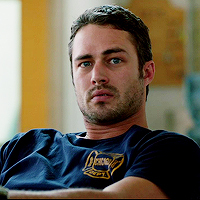 Kelly Severide. . Images in the Chicago feuer (2012 TV Series) club tagged: kelly severide taylor kinney chicago fire nbc 1x01. This Chicago feuer (2012 TV Series) icon might contain porträt, kopfbild, nahaufnahme, portrait, headshot, and kopfschuss.